Learning to read takes time and patience, and sometimes the process can be frustrating. Hoping to aid kids in their journey to read is Emil & Pauline in the Jungle, an app that teaches primary reading and writing skills through educational mini games. The central characters of the app are Emil, the adventurous polar bear, and his penguin pal Pauline. On their trek to the letter jungle, the duo encounters a group of playful goblins who invite them to play word games. There are five games available, each designed to hone foundation reading and writing skills. For example, the Blowball game helps kids learn to distinguish meaningful words from groups of letters that do not make any sense. At the beginning of the game, Emil will blow seeds of dandelion into the air. The idea is to cut up seeds that contain bogus words, such as aik, toa, or flei, before they fall into the river. In the Bees game, kids can practice identifying which article (“a” or ”an”) is used before selected words. 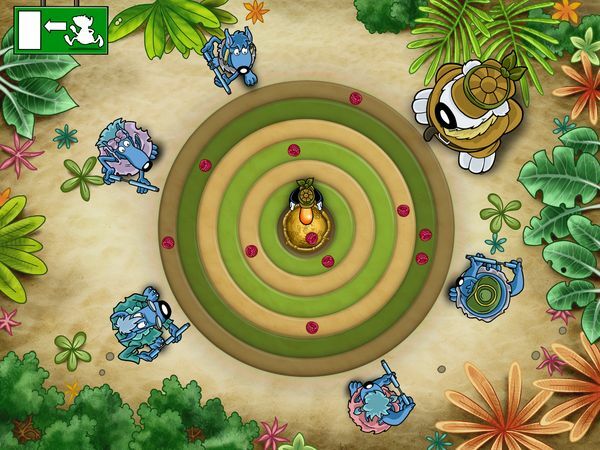 Throughout the game, a bee will fly across the screen while carrying a word. Kids must then tap either the “a” or ”an” mushroom the moment the bee flies above it. There are also two other games to help kids learn about letters: Stars game, in which kids practice writing letters by tracing stars, and Frogs game, in which kids identify letters by their sounds. 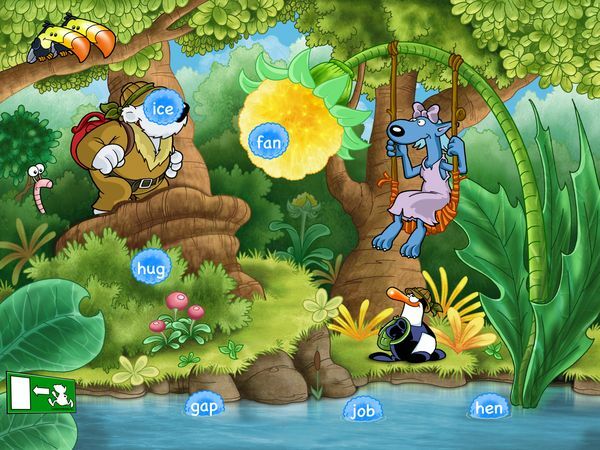 Finally, the fifth game (called Crocodiles game) helps kids associate words with pictures. As an incentive for playing, kids can collect fruit pumps to use in a reward game. Unlike the other games, the reward game focuses on motor skills. Here, kids help the goblins collect berries from a moving conveyor belt by shooting them with air. The reward game is a little tricky because it requires kids to control five goblins at once. However, kids are allowed to play it together with their friends. They can also collect bigger pumps by replaying the word games. Emil & Pauline in the Jungle is simple and intuitive to use. The app is mostly text-free, with all of the instructions provided in voiceover by Emil, Pauline, and the goblins. Helpful hints are available as kids play, as well as praises to motivate them to keep going. Based on its content, the app makes an excellent workbook for kindergarten and first grade students. It is ideal for families with multiple children or classroom settings, as it allows the creation of multiple user profiles. Parents should be happy to know that Emil & Pauline in the Jungle doesn’t contain ads or in-app purchases. A protected section for parents highlights the objectives of the games, and provides the option to switch between English or German narration. You can access this section by tapping on For Parents in the main menu screen. The games themselves are nice. They are fairly straightforward, and their contents are well-adjusted for its intended audience. The words used in the games are never very complicated (mostly three to four letters long), so emerging readers should be able to pick them up easily. It is also worth mentioning that the games get progressively harder each time. Finally, I like the fact that the app is fully narrated to assist emerging readers. That said, I think adding visual clues or tutorials would benefit younger kids. Emil & Pauline in the Jungle is a solid language app that makes picking up foundation reading and writing skills a fun experience. The friendly characters engage kids as they play various educational mini games, and provide them with praises when they do well. The primary games are well thought out and educational, while the reward game motivates kids to replay the games again and again. If you’ve been looking for a language app suitable for kids ages 4–8, I would recommend giving Emil & Pauline in the Jungle a try.